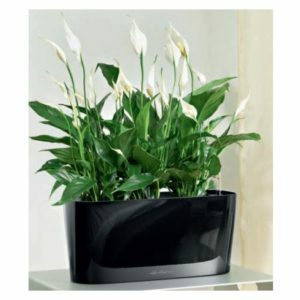 The Peace Lily is a popular tropical office plant. It is suitable for lower light locations but remember, all plants need light for a minimum of 8-10 hours every day. It will do well if it is close to constant fluorescent lighting, or filtered light from a window. The Peace Lily will produce its characteristic lily-like flowers year round if it receives sufficient light. It does not do well in very bright locations. It is often requested by our clients as the NASA Clean Air Study found that Spathiphyllum cleans indoor air of certain environmental contaminants, including benzene and formaldehyde. It is native to tropical regions of Central America, usually found in wet habitats. Its natural habitat are the rainforests, in the shade of larger trees, where the plants receive very little direct sunlight and have adapted to live in low-light conditions.This plant is available in over 40 different varieties. Most have shiny, very dark green leaves and produce white flowers. The most common cultivar readily available is ‘Mouna Loa Supreme’. The ‘Sensation’ variety has massive leaves with striations and produces huge flowers. It can grow to be 4ft tall and looks spectacular in groupings in large planter beds or as an individual specimen in a unique container. Some newer varieties such as the ‘Domino’ have white and green marbled foliage. The Peace Lily is a bit fussy with regards to the amount of water it needs. It requires more water than most indoor plants so be prepared to check it frequently and keep it moist. The leaves will droop quickly if it dries out even slightly, but they will perk up once the plant is watered. Also beware of overwatering…this will cause black edges on the leaves. This is a hardy, disease and pest resistant plant. Remember to fertilize monthly during the spring, summer and fall.